Still haven't found a page that really does the design justice, but the helmet with he two large eyes is evocative of the manta and the all-black swimsuit is beautifully sleek. If I'd have thought of him, Annihilus def would've made my list. I didn't think of Midnight, but I definitely have an appreciation for the cloak and shadow look on a villain. Emptiness for a face tends to evoke evil for me. Huh. That seems like an obvious one (although I didn't think of it!) but this is the first time I've seen him. 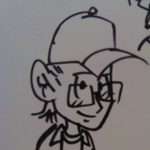 Reed looks pretty good there, for a graying super-nerd. Guess there are all kinds of advantages to having a pliable body. Random thoughts on day Five...which seems less populated that some of the others. Ultivac. I know that I've seen him in my read-through of the Kirby Challs. I love me some giant robuts. Seth. Huh. I suspect I've read that issue of The Authority. But I don't remember it. Ozymandias. I look upon him and despair. I still love The Phantom Blot. Scarecrow. A sad deletion. I like me some Scarecrow. Kang. Sometimes Kirby's designs really kill me. Kang does not. Lumiya. Looks like a desert robot. giant-size Bloodwraith. At least we can't see his Giant-Size Man-Thing. Galactus. The 1950's tail-fins of super-villains. Mr. Fear. We have nothing to fear, but Mr. Fear himself. Ehh. Black Queen. It was great when Diana Rigg wore it also. Shadow Thief. I like him a lot. An angular Phantom Blot. Granny Goodness. Reminds me of my Granny Betty. Not really. They look a lot alike. Similar personalities too. Razorfist. Where to start. First...he doesn't have a fist. Those are blades...not fists. And I don't even want to think about this guy having to take a leak. There are just a lot of hygiene issues here. The Evil Eye. Sauron's cousin? Firefly. The Fire-Bat is cooler. Brother Blood and Trigon. Have I mentioned I'm not a fan of George Perez as a designer. Trigun...Dude...If you're a giant...wear more than a loin-cloth. Because nobody wants to look up into your block and tackle all the time. Seriously. 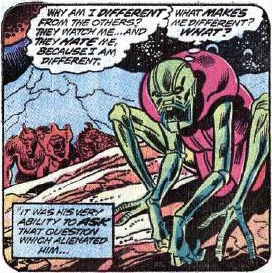 Validus. I like being able to see the brains of the outfit. I agree with Prince Hal 100% about The Vulture. Now if he'd just recognize the genius of Ernie Chua. Reverse-Flash. Kid Flash's costume all growed up. Scorpio. Eh. I prefer Hank Scorpio. Midnight. I like that look. Simple but evocative. 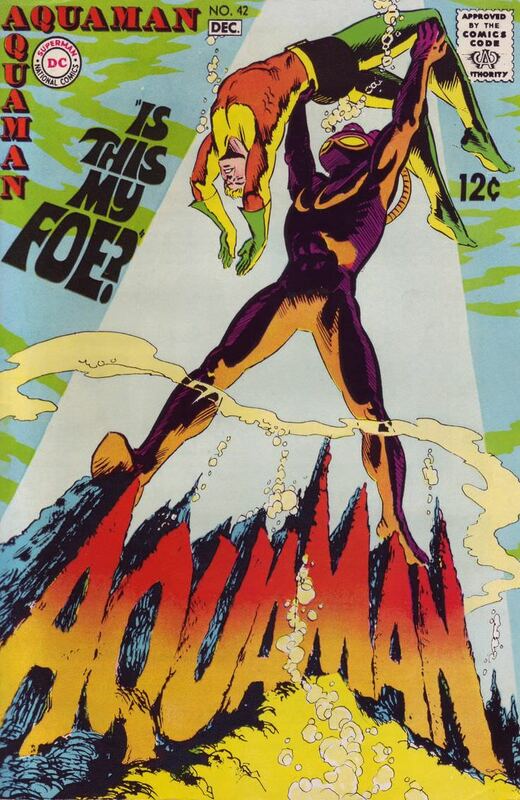 I love me some Annihilus. Black Manta was one of the last one or two to fall off my list. Glad to see him here. I love reading your summaries almost as much as the entries themselves. Why thank you. I hope nobody is offended by my takes. Just trying to have some fun. Nobody being offended? This is the internet, man! I'm going to look for comic books featuring this character ... he's intrigued me and I've never heard of him and got me thinking about it for the past 24 hours. Ha! Yes, I have to admit , I chose that specific panel because I've always gotten such a kick out of how buff Reed looks perched upon that floating debris/rock, thanks to the artistry of Messrs. Wilson and Sinnott. I actually almost made this a tie (since i love Mr. Freeze's design too), but what nudged it to Snart? yep, again, the simplicity of the outfit. The parka, the yellow belt, the fur trimmed boots, the cold gun. . those signature glasses! (that look like only one other villain's. . Mole Man). 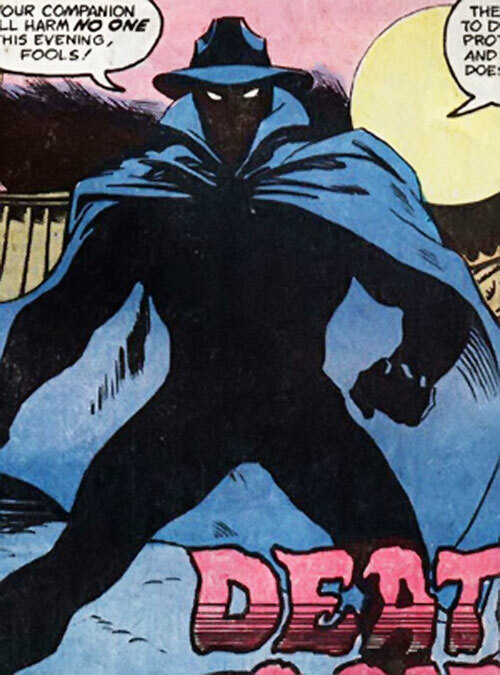 I love the "hat and cloak" design that I suppose must have originated with The Shadow and has been used to good effect on characters like the Phantom Stranger. He looks a lot like the Spirit, and that was intentional. 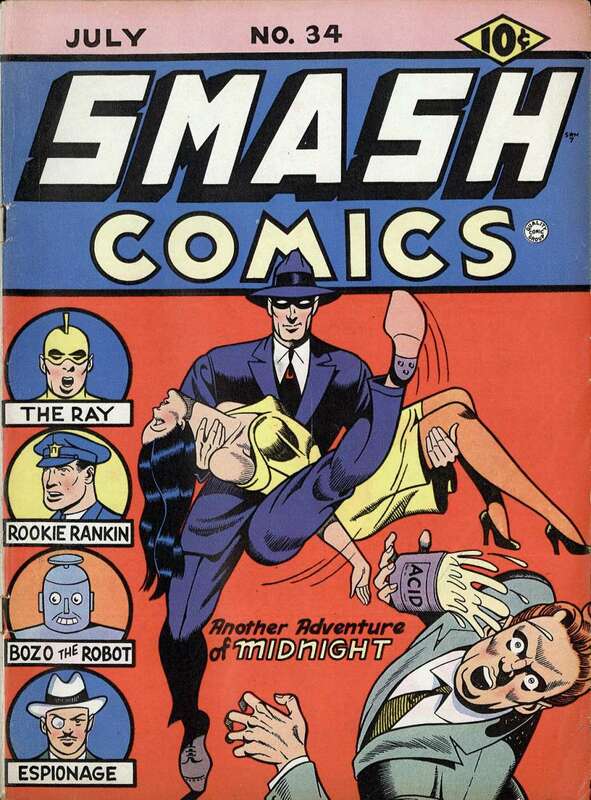 Quality Comics published the Spirit in comic book form, but the character was owned by Will Eisner. Quality publisher "Busy" Arnold wanted to have a similar character that he owned in case Eisner took the Spirit elsewhere.